Monsters thrive in the messy swamps of pop culture. They live in the fertile space where classic literary narratives and traditional aesthetic norms are blown apart by visual strategies born at the crossroads between political turmoil and contemporary taste. The particularly adversarial climate of the current American Presidential election campaign proves that monsters are nourished by culture’s incessant need for new imagery. In an example from a couple of weeks ago, game designer Mike Selinker worked with several illustrators to produce an adaptation of the well known ABC book The Gashlycrumb Tinies by Edward Gorey. The original 1963 illustrated book is an assembly of macabre pictures about children meeting their unfortunate ends through such creative mishaps as being “sucked dry by a leech” or being “devoured by mice”. In 26 different images the 2016 persiflage transposes the visual language of the original source directly onto a set of new images. While most of the illustrations in the amusing A-Z feature distorted drawings of Trump, it is the last picture that eventually sees him morph into a tentacled, bog-eyed and bewigged creature, wafting over a dystopian landscape and ushering the little girl Zeitgeist over a cliff. The Trump ABC is a reinterpretation directly addressing a range of policy issues that the illustrators see as marking out the Conservative candidate as unsuitable for the office of Commander in Chief. In doing so it relies heavily on the retention of the original alphabet structure and uses textual elements to deliver its criticism. This first example shows the ways in which satire allow us to make sense of current issues through already familiar visual contexts. While stealing from or ‘being inspired’ by other art work is one of the most common ways for artists to find authentic expression for their own ideas, most monsterisation processes are a lot more complex than this. Often when a new monster is born, it dodges attempts to be assigned a conclusive meaning. This is not only because it draws its fangs and slimy limbs from a variety of visual sources, it also relies on the violent deformation of forms and contexts. Monsters leech off images that are freely circulating in popular culture. In their bellies they churn around these ideas and regurgitate them into new, puzzling and scary shapes. When monsters fuse the remnants of several texts and images onto their bodies, it is not only incredibly difficult to make out the exact sources that have served as inspiration; exactly what they are saying, alluding to and achieving also becomes much more ambiguous. The origin of Uncle Sam as the personification for the United States is apocryphal but likely dates back to at least 1812 when America was, still, or yet again, at war with Britain. It took about a hundred years, until 1916 for the image we know now to solidify into its iconic state. The illustration by artist James Montgomery Flagg appeared first in the magazine Leslie’s Weekly under the title “What Are You Doing for Preparedness?” and later, in the Second World War, served as a military enrolment poster. The creature with its exposed jaw and teeth also has distinctly zombie-like features. The idea of Uncle Sam as a zombie is not new: in 1996 — a time in which the States were involved in numerous military operations all over the globe — a horror military comedy lured punters into the cinema with the catchy tagline “Uncle Sam wants you… dead!” Now, this unspecific personification of America’s national pride has been swapped for an actual politician. This Trump Monster both invokes the uncertainty about America’s future and plays to the popular conceit of a dystopian apocalypse. The flesh is taken off its face, revealing the sinews underneath which are made up of the colours of the American flag. The ‘rotten core’ forms a visual antithesis to Obama’s iconic 2008 election poster in which the colours of the flag are unambiguous and blocky, an image surface on which ‘Hope’ is quite literally projected. 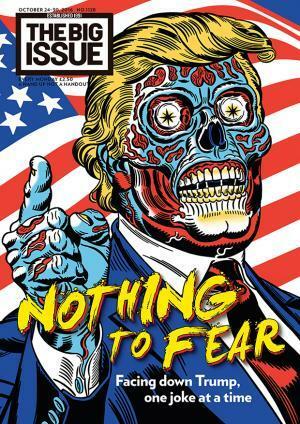 Instead, the projection of fear reflects back at us a jarring zombie-esque face, and instead of “Hope” an ironic “Nothing to fear” in a B-Movie alien flick font is splattered across as an ominous warning. The Trump Alien erupts from the complex paradoxes that underlie American history exactly in that moment when the patriotic idea at the core of Uncle Sam is twisted into senseless oblivion by a demagogue. Another example draws heavily from European cultural history. Greek mythology in particular with its unreasonable deities and suffering demi-gods has been a rich source for artist reworkings throughout the millennia. Cursed by the goddess Athena for ‘laying with’ Poseidon in a sacred temple, the snake-headed female Medusa has become a popular choice especially when attacking women in power. 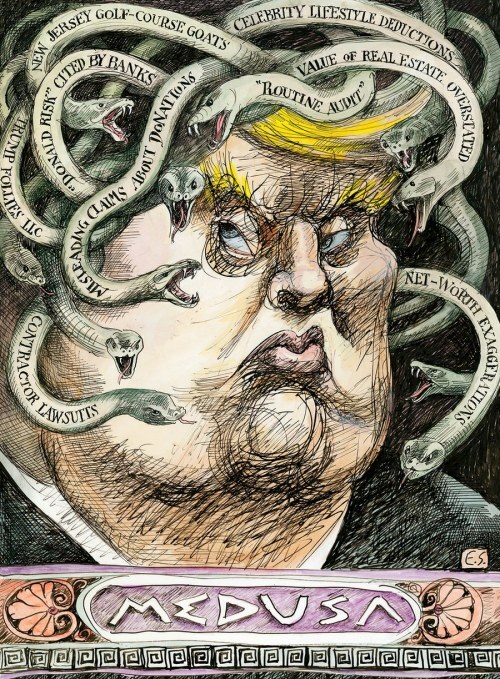 Vanity Fair’s illustration by Edward Sorel which depicts Trump as the ancient Gorgon beast appears a strange choice for a refiguration of Trump as monstrous. According to some interpretations of Ovid’s take on the story, Medusa was cursed by Athena after being raped by Poseidon. It introduces a strange irony into the picture to cast a man accused of and bragging about sexual assault in the role of a vilified woman. There is after all a history of female artists of reclaiming monstrous females, such as Medusa, to probe into female relationships (Sylvia Plath, for example, wrote a poem about her mother which alludes to the myth). The article accompanying the picture discusses the convoluted tax issues around Trump’s business empire. Therefore the central themes of the underlying myth have been completely emptied out and have little bearing on this new monster. Instead, an amusing jibe about Trump’s unruly hair is fused with the symbolic character of the serpent standing in for regeneration. This aspect is perhaps more prominent in the myth of the many-headed snake creature Hydra which regrows a new snake head if one has been hacked off. 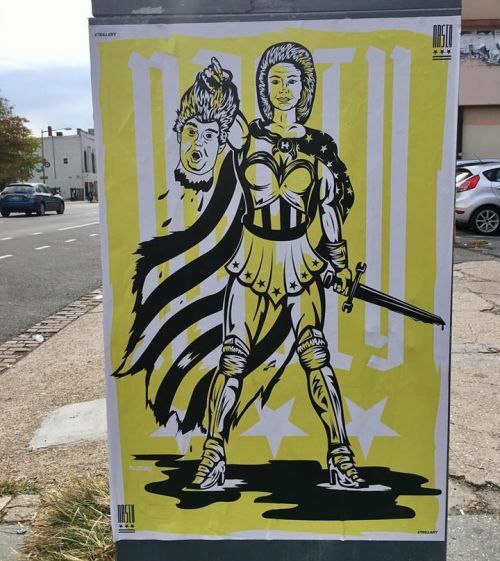 More intriguing in context with the same mythical background is this street poster which depicts Democratic nominee Clinton as a female Perseus slaying the Medusa. While the askew Medusa/Trump parallel is still present, the focus of the image is on Clinton dressed as the American comic book super hero Wonder Woman. In the original myth the alliance between the cursing goddess Athena and the conquering hero Perseus stands opposite the perpetrator Medusa. The two women, according to art historian Marina Warner, act out the conflict between a woman being able to demonstrate and side with masculine strength and female fertility and victimhood (in the moment of death Medusa bears the fantastic beast Chrysaor and the winged horse Pegasus). In the act of violence committed by the new Clinton-Perseus lingers the rejection of traditional binary gender circumscriptions that govern how are females in power are supposed to act. The picture also alludes to the misogynistic attack that Trump has repeatedly launched at Clinton. On top of the figure the word ‘nasty’ is printed in a celebratory gesture of reclaiming a word that was meant as an insult. The way figure and font are positioned in relation to one another echoes pop artist Beyoncé’s reclaiming of the word ‘feminist’ in one of her performances. Only in taking on the role as the Medusa slayer and exerting violence, the proto-masculin hero turns into an empowered female. For those who want to know more about the Medusa, Elizabeth Johnston has written a great article for The Atlantic examining how throughout history powerful women have been vilified through portraying them as the gorgon. To finish off this menagerie of political monsters, I would like to share one of my favourite Trump monsterisations. It comes from a blog on tumblr that regularly posts stomach-churning photo manipulations using a different, uglifying strategy. Instead of overlaying countless intertextual references the artist reduces the facial features of Trump to only a few aspects (hair, chin, mouth) and distorts any human familiarity. It’s a literal defacement of the politician the artist would like to get rid of. 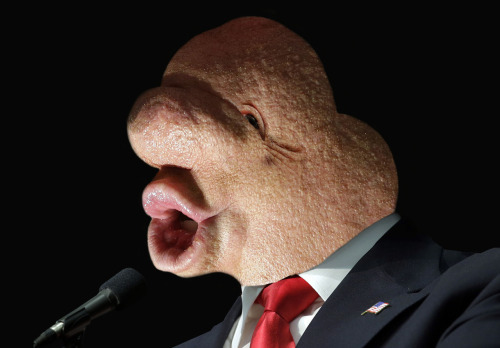 This deformation transfixes the perceived human failure of the candidate on moral, ethical and behavioural levels onto the visual body of the new monster. When new creatures come to life, an awareness for the visual strategies involved in their generation is vital in order to pin down the heavily politicised ideologies behind them. The kinds of monsters we encounter in popular culture are part of the currency of creatively facing contemporary challenges. Marina Warner, Monuments & Maidens, (London: Vintage 1996), pp. 113-114. This post was originally published on ‘I Collect Monsters’. You can find the original post here. The abstract deadline for the conference publication ‘Promises of Monsters’ is closing in, and some of the editors have rallied together to shamelessly steal a bunch of questions (and sometimes even answers) that they can ask themselves in order to shed some light on the upcoming issue. If you have questions that are not answered here, you’re always welcome to contact us at promisesofmonsters at gmail dot com, and if you’d like to read the full call for abstracts, you can find it here. Before moving on to the actual questions, we’d like to stress that even though this is an issue based on the conference Promises of Monsters, which took place in Stavanger in April, this issue is open to all submissions, also from scholars and artists who didn’t participate in the conference. The abstract deadline is the 17th of October. And now to the stolen Q&A! Donna McCormack: Monster studies opens up the possibility of exploring a whole array of themes, topic, theories, representations, art, histories and more. It crosses disciplines; it’s serious, funny and scary; and it is deeply theoretical, ethical and political. It is the monster’s capacity to address what is often ignored or just in the sidelines, or at the centre of our thoughts as the most hated, despicable or enticing of beings that I find appealing. It seeks to grapple with how formations of exclusion, violence and surveillance work, and therefore pays attention to embodiment as central to our being in the world with others. Why does the issue invite both art and academic contributions? The (Care) Robot in Science Fiction – A Monster or a Tool for the Future? Quite recently, care robots have begun an invasion into our lives and have given rebirth to the hopes and concerns considering both utopian and dystopian technological futures. When introducing a new generation of service robots in our daily lives, it is therefore interesting and important to consider how they have already been imagined in science fiction, as these imaginations can be used to make visible the problems as well as promises inherent in close relationships between humans and machines. The main motivation of this short introduction to science fiction is to enhance dialogue on the human and non-human dimensions of robots. Are you considering submitting an abstract for the upcoming special issue of Women, Gender & Research on the subject of Monstrous Encounters: Nordic Perspectives on Monsters and the Monstrous? Would you like to know more about what the editors are looking for, and how they imagine the special issue to turn out? Are you concerned that they might secretly be lizard people? The editors of the special issue have asked themselves some important, existential questions in order to dispel your worries and make you want to join the dark side. Read on as they grapple with the important philosophical questions of our time, such as: Why monsters? Why now? And which one is the coolest? Have no idea what we’re talking about but would like to learn more? Read the call for articles here. A month or so ago, I entered two of my unpublished books into the Half the World Global Literati Award competition: a novella, “Dating Superman” and a young adult fantasy novel, “The Talkers”. This competition aims to “give voice to the inner lives of women” and sought rounded female protagonists, with a grand prize of $50,000 for the winning entry. What is the future of Monster Studies? Where is the monster headed? And should we follow? The monster is a creature of disruption and uncertainty, which means that such questions may perhaps best be approached through even more questions. Here follows some of the questions and suggestions raised by the participants at the closing panel of the Promises of Monsters international conference. Through the performance of The Blob as well as an open discussion, the closing panel opened up to the possible and not least impossible futures of monsters and Monster Studies. For more on the subject of the futures of monsters, see Donna McCormack‘s The Future of Monster Studies and Asa Simon Mittman‘s The Impact of Monsters and Monster Studies. How will monster studies affect political change in the world, if at all? Evolutionary theory is a contentious issue, with even its own scientific veracity being denied. It is a subject of constant discussion and dispute in the media, popular culture and across many disciplines in academia. We need only think of the recent TV series of Orphan Black and of Google’s doodle on 24th November to celebrate 41 years of the discovery of Lucy (whose existence threw into question previous theories of bipedalism and brain size). Lucy’s existence shows us that the science of evolution is itself in the process of being uncovered, and yet, despite such uncertainties, little scientific emphasis is placed on what is at stake in proposing, accepting and discrediting particular interpretations of evolution. We often see a religious contention, which asserts that evolution is simply wrong, but what if we can think of evolutionary theory differently from the narrative that was challenged and rethought through the discovery of Lucy? A residue of Halloween lingers as the Monster Network circulates its most recent news that 2016 will include its first international conference. Halloween brings to the fore the repetitive return to our daily lives of the monstrous, the deadly, the horrific and the downright comic. Such festivities cross national boundaries, build on distinct and yet overlapping traditions, and tap into the ever-expanding arms of economic profiteering from plastic accessories and non-recyclable costumes. Yet for the Monster Network this monstrous event was momentous in launching our new website, which already contains the amazing artwork of Tove Kjellmark, and the call for papers for our first international conference.